The journey has taken me away for a little while as my wife and I were on vacation recently. We traveled out to Texas to visit our new granddaughter who will be a year old on Sept. 28. My son and daughter-in-law relocated out there from Connecticut just a few months before little Cecile was born, so this was the first chance that we’ve had to meet her. She’s not quite walking yet, but that doesn’t seem to slow her down much. She sure is a busy one, very curious about everything especially Grandpa’s beard. The Dallas-Fort Worth area of Texas, where the kids live, is a huge area. Just getting from the airport to where they live was an adventure in itself. The 20 or so mile drive ended up taking us several hours due to traffic and getting lost a few times just for fun, made for an exciting trip. The kids had planned a short vacation for themselves during our visit. They rented a beautiful cabin nestled in the Quachita Mountains of southeastern Oklahoma, along the border of Arkansas. We were in the town of Broken Bow, Oklahoma which also is the home town of country singer, Toby Keith. Although we didn’t get to meet Toby, we did get to spend some time at Beavers Bend State Park. The park is very scenic with a massive reservoir as its centerpiece. I’d imagine the lake is several thousand acres at least. We visited one of the small bays where canoes, kayaks and paddleboats were for rent. We all had a great time cruising the back bay in our paddleboats. I think the baby was more interested in her lifejacket than anything else. While driving around the park area, we encountered an armadillo that was busy digging a hole by the side of the road. They sure are an odd looking creature. To me, they are sort of a mix of rabbit and armored plated something, not sure what, kind of cute though. We also made a stop at a nature center along the trip. 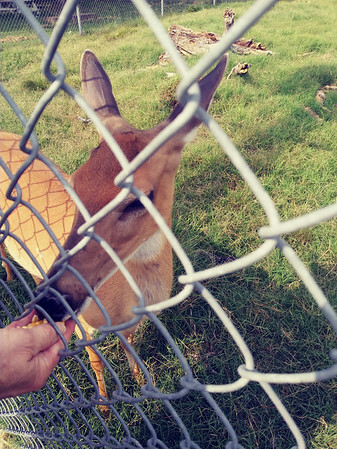 My wife got a chance to hand feed a deer which was pretty neat. I enjoyed seeing all of the wildlife exhibits, especially the deer and elk antlers. As with all things, our vacation came to end and we boarded our plane for the flight back home. Hopefully I won’t have to wait another year to see my little granddaughter again. Back on the home front, the summer is winding down rather quickly. It won’t be long before the first chills of the autumn season arrive. Many of us are already making plans for the upcoming deer season, which for archers begins on Saturday, Sept. 15. The hot, humid and rainy weather we’ve had here of late hasn’t been too inviting for any walks in the woods. With milder temps and lower dew points predicted for the rest of the week, I think the upcoming weekend should be just perfect for scouting or any adventure into the outdoor world. Posted in New Britain Herald, General Sports on Wednesday, 22 August 2018 20:55. Updated: Wednesday, 22 August 2018 21:59.